"Disco / Karaoke Quiz Nites Theme Nights, Weddings"
Hi Fulltime Dj, i love being a Mobile Dj , reliable and proffesional Service. Required by many venues, John Headley Roadshow has a current PLI policy with AMP DJ in the amount of £10 million. Also required by many venues, John Headley Roadshow has supplied satisfactory evidence of holding current PAT inspections of their equipment dated within the last 12 months. A Method Statement, outlining John Headley Roadshow&apos;s Health & Safety procedure for setting up disco equipment has not been supplied. Why do people choose to book John Headley Roadshow? Good Reviews, and good communication. Pleasant, had what I want and reasonably priced. First response, good reviews and reasonably priced. "Absolutely fantastic, John made the party. He interacted well with everyone from young kids to pensioners, a great time was had by all. Couldn’t fault in anyway. Highly recommend." "John was brilliant with entertaining both adults and children, with games and a wide range of music to cater for everyone. A lot if guests commented on how good he was and u would definitely use him again." "Great night, thank you "
"John was great to deal with from start to finish. He was brilliant on the day and kept everyone entertained - even in the rain! Would certainly recommend and look to use again. " "Very good DJ, all the guests commented that he was very good at getting everyone involved and on the dance floor, would definitely book again! " "John got in touch by text message and voicemail very quickly, and was very efficient. Good communicate between the booking and the day of the event. John adapted his content to suit the children's nature on the day (this as for a 4 years olds birthday) and was sensitive to our needs. We would definitely book John in future and would recommend." "Very nice family, thank you "
"John also provided x2 prizes for a couple of games which wasn't expected, he was very in tune with what we needed on the day and reacted positively to the request made by Carers. Many thanks"
"Loverly people thank you "
"John was fantastic during our party. We had a real mix of ages from 2 year olds to 70 year olds which he managed to entertain perfectly. I really liked the music games he did with our younger guests. He was really professional and is the best dj we have used. We will definitely use him again for future events at my pub." "Thank you very was a great night "
"A DJ can make or break a party and choosing one is like doing the lottery. Fortunately we hit the jackpot with the John Headley Roadshow. So much more than a disco, John organised a few light hearted competitions during the evening and nothing was too much trouble. Thanks John, brilliant stuff, We will be heading your way next time we have a party. Robin, Margaret and AJ"
"Great People and birthday boy I really enjoyed the night. Top friends and family, all the very best to you all ye har"
"What an amazing night at my daughter's engagement party. Everyone commented on how good the DJ was. Before the event John communicated brilliantly and I felt confident he knew what we wanted. He was perfect. Just the right mix of music and interaction. Great music choices. My daughter and her friends have learning disabilities and John completely kept the dance floor full all night. Exceptional!! Thank you"
"Very reliable, good with requests and guests good value for money nice personality. Telephoned before event to see if any other service required would recommend"
"Thank you very was a great night"
"Absolutely fantastic! Highly recommend. John interacted with the children and played lots of games and kept them well entertained for the whole party." "Im an Aries easy going all the very best to you and your family"
"John provide excellent entertainment for my Bowls Club Presentation Night. He telephoned prior to the event to discuss choice of music and format. I have had several of the guests contact me since to say what a great night it was." "Excellent is all anyone needs to know"
John Headley Roadshow also offers a range of additional party services not directly linked to musical entertainment. 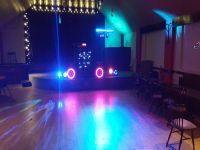 Get FREE no-obligation disco quotes from John Headley Roadshow and other DJs covering your venue. Take 2 minutes to fill in some basic details and we'll do the rest! If you are contacting John Headley Roadshow about an event, it's always a good idea to include the DATE, LOCATION, EVENT TYPE, AGE GROUP and TIMINGS to speed things up!